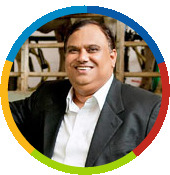 Parag Milk Foods Ltd was founded in 1992 by Mr. Devendra Shah as one of the founders & Chairman of the organisation. The genesis of the foundation of the organisation was the adversity faced by farmers of the area and Devendrabhai’s concern for the society at large. At a young age of 27 years than, he took the bold step of helping the farmers in distress and thus laid the foundation of what would turn out to be one of the elite private dairy companies in the country. He has always had a flair for spotting opportunities and a very high risk taking appetite. His visionary approach has helped us take bold steps like building the largest cheese plant ahead of time, as one example. Gifted with chutzpah and flair for marketing, he has travelled the globe, bringing back with him Product & Technology Ideas which have led to dairy advancements like building the 1st real western dairy farm. Unfettered by convention, he has taken a contrarain view and this has helped us build a national dairy business with focus on value added products with adaptation of newer technologies. His hand-on approach in managing the organisation has involved him in new product development, being personally involved in branding and advertising. Underlying all that we do at Parag, is his concern for our largest stake holders – Farmers & our Consumers. He says “ Though India is the world’s largest milk producer,our animal productivity is dismal. There at Parag, our endeavour should be to help milk producing farmers in boosting milk productivity &reduce cost of production of milk and milk products & make it affordable for the masses, which in turn will help enhance the health & nutrition of the country. We will therefore deploy state of art technology to boost animal productivity & develop range of milk and milk products thatare of world class quality and market them under well defined brands. His deep roots in rural India, has helped him change the face of rural Maharashtra in the vicinity of the plant. Apart from his full time engagement with Parag Milk Foods Ltd, Mr Devendra Shah has been involved in various social uplifment initiatives with many social organisations. He is also the chairman of a local co-operative bank Shard Sahakari Bank, one of the founders of Bhimashankar Sugar factory, secretary of National Centre for Rural Development (working for education development in rural India). He is a member of the Executive Committee of Indian Dairy Association ( IDA ) West zone and has been nominated by the Government of India to the Managing Committee of National Dairy Research Institute ( NDRI ) Karnal.